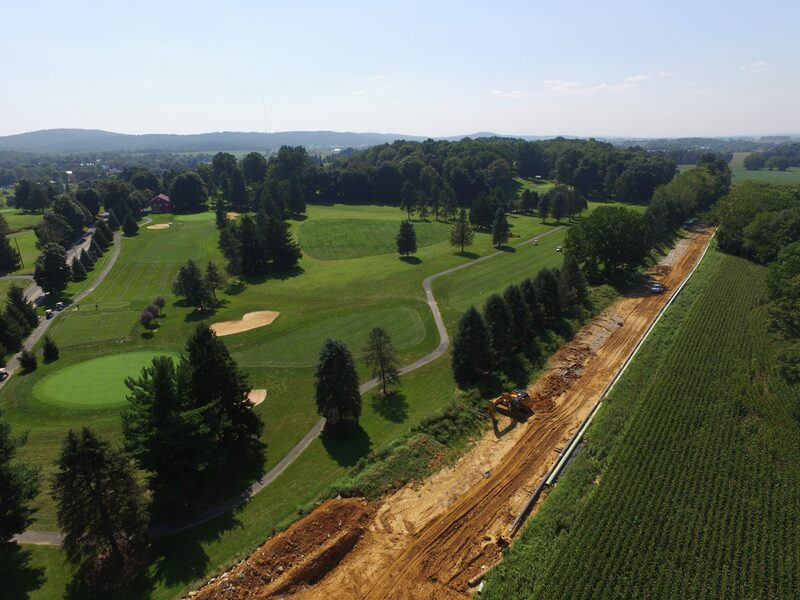 An aerial view of Mariner East 2 pipeline construction, adjacent to the Fairview Golf Course in Lebanon County August 24, 2018. Dangerous incidents involving pipelines are rare, but September has been a bad month. Pipeline explosions rocked communities near Pittsburgh and Boston — causing evacuations, destroying homes, injuring dozens of people, and killing a young man. Pennsylvania is in the midst of a pipeline-building boom, and the Mariner East 2 natural gas liquids line is supposed to come online soon. It’s created a lot of controversy — and fear. He said he laughed out loud when the company building it sent him a mailer with its safety instructions. While he may not be able to see or smell a leak, Sunoco Pipeline warned he must avoid creating any kind of spark — even by ringing a doorbell — and head upwind, away from a cloud of highly flammable things like ethane, propane, and butane. “The information you get from Sunoco is don’t start your car, don’t use your cell phone. Just run away,” Stober said. Many things play into how people perceive risk, according to David Ropeik, who has studied some of the biggest fear factors. Pipelines hit on a lot of them. For one thing, he says, people rarely get to choose whether a pipeline will run through their property. Companies like Energy Transfer Partners (the parent company of Sunoco) are often granted eminent domain. The Mariner East project is part of a set of export pipelines — so a lot of Pennsylvanians are being asked to live next door to something that may not bring them benefits, but carries a risk. But if something goes wrong, it could be devastating. Researchers call this the dread factor. On average, sharks kill about six people globally each year. Although rare, it does happen: a 26-year-old man was killed this month while boogie boarding off Cape Cod, Massachusetts. In the U.S., pipelines have killed average of 17 people per year, and injured 65 per year, over the past two decades, according to federal data. As a former journalist turned author and consultant, Ropeik has advised groups including the U.N.’s Intergovernmental Panel on Climate Change and pipeline companies about how humans perceive risk. He says it also matters if we trust the other people involved. Situations can also seem scarier if we don’t feel in control, according to Stephen Broomell, an associate professor of social and decision sciences at Carnegie Mellon University. He gives the example of flying in an airplane (which is, statistically, a very safe thing to do) versus driving in a car. Fatal crashes kill tens of thousands of people on U.S. roadways every year. “When you’re driving a car you have the wheel in your hands, you may feel like you’re such a great driver that you can remove yourself from dangerous situations,” he said. But even the best driver can’t control the behavior of other people on the road. It also matters whether a risk feels familiar or unfamiliar. The less people know about something, the scarier it can seem. But “riskiness” often means more to people than simply looking at the probability of fatalities. No matter what the statistics are, Broomell says people need to be heard. Despite the risks, there are many clear benefits to pipelines. The products they carry heat homes, powers factories, and generate electricity. On his Lebanon County farm, Stober is not happy about the Mariner East pipeline, and he joined a local group fighting it. But he said he doesn’t lay awake at night over the possibility of it hurting him personally. He’s more worried about the bigger global threat of burning fossil fuels: climate change.